As a southerner, Manchester tart is not something I grew up with. For others, though, it can bring back mixed emotions of childhood and awful school dinners. It warrants a mention in Peter Kay’s autobiography The Sound of Laughter, although he may just have wanted to make the obvious joke: “You can never have too much Manchester tart. Paddy McGuinness will back me up on that one. Only he won’t be talking about the pudding.” Right, now we’ve got that out of the way, no need for any more sniggering at each mention of Manchester tarts. 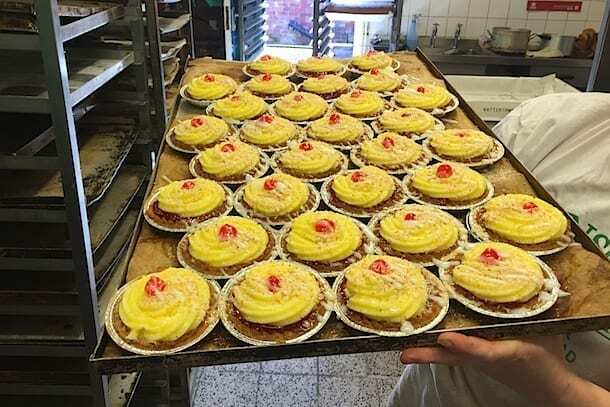 There is no definitive recipe for the Manchester tart although it is now generally accepted that the fundamental ingredients are shortcrust pastry, red jam (usually raspberry), custard, coconut and a cherry on the top. Marcus Wareing revamped the recipe a few years ago adding rum-glazed bananas but this remains a controversial ingredient. The origins are normally traced back to everyone’s favourite plagiarist, Mrs Isabella Beeton. Her Book of Household Management was first published in 1861 but there is no sign that this particular recipe was, errr, borrowed from one of her favourite sources – Eliza Acton’s Modern Cookery for Private Families (1845). Mrs Beeton’s recipe is for a ‘Manchester pudding’ which is similar to what we would recognise as the tart today but lacks the coconut which you would have been unlikely find in a Victorian Tesco. I’m sure there is a Monty Python sketch in there somewhere. Surprisingly academic writing on the Manchester tart seems to be lacking. It does, however, get a mention in a couple of places. In a 1946 article about the favourite foods of children in the East End of London in the Second World War, the Manchester tart is listed in the top 5 favourite dishes, losing out only to pancakes and exotic canned fruits such as pineapple and loganberries. Right at the bottom of the list, by way of contrast, is rice pudding made with dried milk which only got 2 votes in favour and 2,312 against. The other article I found is in the journal of Epidemiology and Infection (stay with me here). The article covers a 2003 outbreak of gastroenteritis on the British Royal Fleet Auxiliary ship Argus deployed in the Northern Arabian Gulf. The purpose of the study was to see if the source of the bug could be traced back to a particular foodstuff, given the details of who had eaten what over the course of a couple of days and who had become ill. It turns out that those who had eaten the salad were six times more likely to have been struck down than those who ate the Manchester tart. What do I conclude from this? That Manchester tart is better for you than salad. Thank you epidemiological analysis. Who am I to argue with the maths? The Manchester loaf, on the other hand, does not have such a rich history. It’s a soft yet crusty white cob loaf, sometimes called a Manchester cob, cut in a distinctive criss-cross pattern. 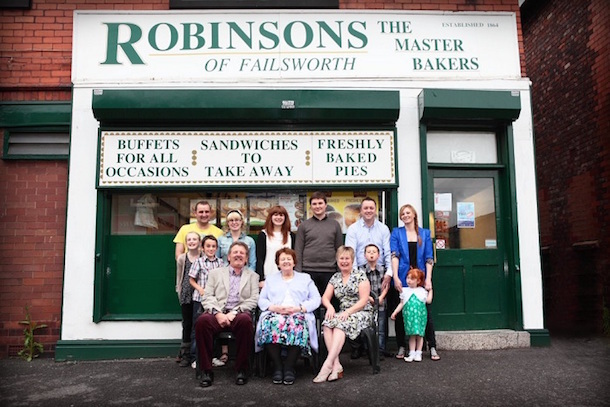 I caught up with David and Grace Robinson, the father/daughter (fifth and sixth generation respectively) team who run Robinson’s Bakery in Failsworth, to find out more about the Manchester tart and loaf. They claim to be Manchester’s oldest family-run bakery, having been established in 1864. Their current site opened in 1954 after a move from Rochdale Road in Harpurhey. The bakery now occupies two adjoining properties at 69 and 71 Ashton Road East, David having lived with his parents in one of the properties before the bakery needed to expand. I am greeted by Grace and taken into the rabbit warren of mixers, ovens and sheets of freshly baked pastries, pies, tarts and bread behind the counter. It’s a busy kitchen with people dancing around each other and timers going off every 30 seconds. Pretty much everything is made by hand here, and they are passionate about preserving the traditional methods used to make their products. She’s not wrong. It’s the softest bread I have ever felt, and the crust is crisp and chewy. A crustless sandwich made with this bread? Not on your life. I start to pry. “Is there something like milk in there?” “Nope,” Grace replies. “It’s literally just flour, water, salt and yeast.” Looks like I’m not going to be getting their secrets to making the perfect loaf any time soon. Just as I’m shoving a large piece of sourdough into my mouth, David arrives. “Another ginger, eh?” he says with a smile, referring to his daughter and me. David tells me about various bits of TV exposure that they’ve had in the past few years that have helped business. They were visited for an episode of My Life on a Plate featuring Arlene Phillips, an episode of Len and Ainsley’s Big Food Adventure, and have even been involved with election coverage. What motivated you to start producing the Manchester tart in the first place? David: Manchester tart was one of those things that we weren’t taught at college. One of my pals used to say “Why don’t you make Manchester tart?” Then shortly afterwards someone came to us, one of the independent coffee shops in Manchester, and said they wanted to do Manchester tarts in all of their shops. So I said we’ll make some Manchester tarts. They were selling three or four hundred a day for the Manchester Food Festival, so we carried on making them from then. 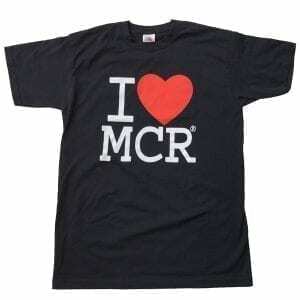 We did our first market in 2011 and we thought, what can we do that represents Manchester? So we said right, Manchester tarts and we’ll do the Manchester loaf. And people went mad for them. You immediately engage with the customers because they say “What’s a Manchester tart?” and you start to explain what goes into a Manchester tart and it creates a dialogue. It’s not like taking a packet of biscuits off the shelf, there’s something more there. After that we did the Christmas markets. Grace: Yeah, we’ve got big signs up on our market stall saying ‘Manchester tart.’ So, first of all, when people see it they start laughing because we’ve got some girls that stand under the sign. Then they go “Oh, a Manchester tart, I’ve not seen one for years” and “that looks nicer than what we had at school.” We’ve gone from selling, say 12 a day to say up to 200 hundred. There doesn’t seem to be any kind of definitive recipe for the Manchester tart. What are your feelings on bananas? David: A lot of people ask us about bananas. They come to the market stall and say “Does it have bananas in it?” We answer “Oh, that’s a Salford tart.” Most of the people I’ve spoken to say no, it doesn’t have bananas. I suppose it depends which school you went to and who did the school dinners. But I don’t think it’s got bananas in it. Bananas and custard is a pudding, isn’t it. But it’s not a Manchester tart as far as I’m concerned. Does the Manchester tart bring back feelings of nostalgia for you? David: Unfortunately, for me, school dinners weren’t happy. I can remember horrible steamed fish and cabbage that’d been boiled to bits. And prunes. It didn’t do anything for me. 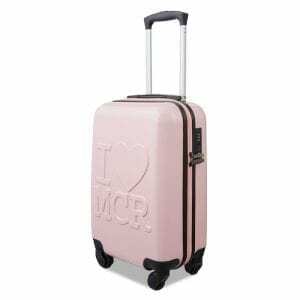 Have you ever thought of doing a fancier version? Grace: We went through a stage of making all the different flavoured ones. We did a chocolate one, a strawberry one and a banoffee one and things like that. It was good for a while, but then we just found that people just wanted a traditional one. Have you get a secret recipe? Grace: It’s all in the pastry. David: We follow the recipe 98% of the way but we’ve made one slight improvement on it we think. But we can’t tell anybody. So there is a secret? David: We think it makes it a lot nicer. Something to do with the pastry? David: Err. I can’t tell you. Foiled again. And I thought I was being so subtle about it. David: I was brought up in the bakery trade. I was classically trained, went to bakery school. My mum and dad taught me all about it. I went to work in other bakeries to gain experience, and that was what you did 40 years ago. Now there are virtually no bakery schools. I’ve taught Grace everything she knows. Plus, you can pick up bits and pieces off the internet and talking to other people. But there’s no substitute for being here day in day out? David: Absolutely. Plus, a lot of the things we make are the old fashioned items, which people still like. You’ll always get new trends like cupcakes. We bake a very small number of them, because we bake hundreds of other things. We can only make so much. We’re not a factory. We have certain labour saving devices, but everything is pretty much cooked by hand. When you’re making bread and pastry, you’ve got to have that feeling in your fingers. If I’m mixing a dough I can just touch it, and because I’ve been doing it all my life I know if that’s right or if it needs more water or doesn’t have sufficient water in it or if it’s been mixed enough, all by the feeling. Somebody once said to me when I was very young “David, you should set out to learn something every day of your life” and I’ve always got that at the back of my mind. Grace: You almost know how to use Instagram now don’t you? David: Oh I wouldn’t go that far. I decided that that was my cue to leave. You can get your hands of both of these delights and more at the Robinson’s bakery in Failsworth or at their stall at Piccadilly Markets on Thursdays, Fridays and Saturdays. I’d grab a loaf of their sourdough, too, while you’re at it.